This cult classic is as versatile as they come. The Carmex ® lip balm jar is best known as a daily lip balm suitable for all seasons. Packaged in a handy pot, it can be used under or over lipstick for a gloss finish that helps to add moisture and relive pain from rough, chapped lips. When first applied, Carmex provides the lips with a tingling sensation. Enriched with camphor & menthol in a base of cocoa butter and waxes, the formula also includes salicylic acid to assist in the mild exfoliation and refinement of the delicate lip area. This product is ideal for general maintenance and is the man's favourite of the Carmex line. This has been my go to product since I was 16. This stuff is amazing and so nourishing on my lips. I had my friends recommend the paw paw and all the other dads but nothing has ever compared to the benefits of carmex. I would recommended this product for anyone who wants a good conditioning treatment for their lips. I know some people has said it’s messy and dirty. I would recommend using the tip of your finger nail as a spatula. I have never had an issue with this this. Dry cracked lips. Cold sore management. This lip balm is super moisturizing and is long lasting , really ideal hand bag tin doesn't take up much room, is easy to find and is tightly shut so no dirt gets in as it lives in my hand bag. ideal in winter for treating my wind burn and helps prevent it so long as i apply multiple times of the day. I would love to see a bigger version to keep at home of this product, however the small products are budget friendly. I always keep a few of these around the house or in the car because I'm always in need of a good lipbalm, one of my faves because they just work, and are very soothing on dry and very cracked lips, which I get at any time of the year. I love that they bring out limited edition ranges because they make them more fun to collect. A very good product and affordable as well. No matter the time of year I always have severely dry and cracked lips due to sleeping with a fan on almost all year round. Now I know it seems as simple as turn the fan off. But I can't sleep without the white noise it creates. I use carmex at night and in the morning my lips aren't dry or cracked. And I apply generously often throughout the day. This product does have a tingly feeling when first applied. Depending on the severity of the state of your lips it can range anywhere from a bearable mild burning/tingly sensation to a barely noticeable small tingle. The product is thick and supplies alot of moisture and is great under matte lipsticks. I wouldn't suggest as a gloss over the top because I've found it removes alot of product. It is the best lip balm I've tried in my lifetime. It's moisturizing, lasts forever, affordable and easily accessible. You can buy it from any supermarket. The definition of a holy-grail beauty product. Carmex lip balm is a cult classic beauty favourite that well deserves its holy-grail status. I have been using Carmex on and off for years now and I always find myself returning to it when I have seriously dry and chapped lips as it's the only product out there that fixes the problem. Most lip balms just tend to soften and smooth your lips for a limited amount of time, but I find Carmex to be the one that goes a step beyond and actually heals the lips of any irritation. I will say that it does sting a little on application, especially if you have any deep cuts or irritated spots on your lips, but this subsides in a few minutes. I feel like Carmex is my go-to lip balm on the market and I really would recommend this to everyone that has troubles with cracked and chapped lips, especially in the winter months. This is one of my regular lip balms, particularly in winter. It smells really nice and has a tingly sensation when you first put it on (which I love). It’s quite thick and goes well under lipstick, but it’s not glossy so not the best for over the top of lipstick. The only drawback is the tub it’s in, which makes it difficult to get out and can get dirty easily. I know what you're thinking, how can your rate this product 3 stars when the classic role up is 5 stars? Well its just this minor thing that I HAVE to tell you about! It's messy! My golly-gosh it is messy. Your finger gets all sticky and wet and then you have to find somewhere to wipe it! And eventually the pot will get dirty and It will all go to the dogs! Of course all the good things still stand, its moisturising and clean, nice and glossy but the mess, I just hate that mess! Don't forget to close the pot because you'll get dirt in it! And if you're using on a regular basis carry tissues! After trying many lip balms , this one is certainly one of my faves. I bought it in a sale after hearing the hype so I can give it a try. It comes in a handy small tub and the consistency is nice, it goes on lips smoothly and leaves it smooth and hydrated. Though it gives a light tingle for a couple of seconds. It is perfect for hot/cold weather. The packaging is nice but compared to some other balms it is a bit clinical. A lot of other products didn't do much for my red and dry cracked lips, but carmex worked pretty well in restoring and repairing my lips. It's inexpensive, doesn't really have a scent, and it also works around the year. It definitely lives up to the hype as it does such a great job of protecting the skin from the elements. It comes in a jar so it's a little hard to apply without your fingers getting messy, and there's also the chance that other stuff can get into the jar. I love carmex lip balm and have been using it for a long time. I find it the most useful in the winter months when my lips tend to be a bit drier and chapped. I keep a jar next to my bed in my bedside drawer and apply it to my lips each night before I sleep. It has a soothing feeling and keeps my lips moisturised throughout the night ensuring that my lipstick looks great the next day. A jar lasts me ages and is reasonably priced. I keep a jar in my car and handbag also. It works great. The Carmex lip balm jar is a great lip balm for all year around. It carry’s a punch of high moisturising ingredients to nourish skin in the dry and windy parts of the year. It restores cracked and chapped lips in just a few days offering a swift source of relief. The round tub make sure it’s easy to carry on your purse or gym bag. Although is a little difficult to apply if you have longer nails. A great staple for any beauty bag and offers good value for money. I love the cute packaging of this lipbalm. I think it is quite iconic and I have used it for such a long time and keep on repurchasing. It hydrates my lips and provides a great glossy finish. it has a light minty sensation and smells great too. Everybody in my house loves carmex lipbalms. Love that it kind of exfoliates your lips too because of the addition of salycilic acid in it so the dry flaky bits are removed and you have smooth soft lips in no time. I first bought this lip balm a few years ago when my friend recommended it to me when I had wind burn on my lips, and it has to be to date, one of my favourite lip balms of all time. It keeps your lips soft and moist and protected from the wind and the cold, and is especially great in the Winter time. It is definitely an essential product that everyone needs. This is such an amazing product for chapped lips and it was one of the first products i tried from carmex. I've now expanded my horizons and i do prefer the tubes just because it's a little less messy - however i do love how small the little container is. Leaves my lips looking really smooth and glossy and with little flaking. Overall, a great product - especially in the dry winter season. The Carmex lip balm jar is something I've been using for years. I've tried quite a fair few lip balms but none of them helps my chapped lips they just sit on top of my lips and don't absorb. the Carmex lip balm absorbs into my lips and helps to heal them when they are chapped. I like it being in a jar cause then I can get the product out in small amounts and not use too much which is definitely better than a tube. and its also very helpful cause you can see when you're about to run out of the balm. So I did go through a phase of regularly using this product as well as Blistex's alternative, however, these products just don't do my lips genuine justice long term and I found that the longer I used them, the more reliant my lips seemed to become on using them. This balm would only help temporarily and could have its place in helping with occasional, more severe problems on the lips, but for regular use I found myself needing to use it more and more to maintain soft lips and decided after a while that it wasn't genuinely hydrating my lips and decided to switch to more natural lip products with ingredients that truly nourish my lips. The tingle of this product for me was gentle and nice, and it did do its job well when my lips were in a really bad way, I just wouldn't recommend it for long-term use! I have really dry lips, especially in winter. My lips are sooo dry, that before I found this lip balm, my lips sometimes cracked so much they would bleed. Yup. Not nice. However, this lip balm has been a real life saver! It softens my lips and moisturizes really well. It has humectant moisturizers like beeswax that draw in moisture from the environment, and occlusives like petroleum that seal all the moisture in. This lip balm also has menthol, which makes the lips feel cool and tingly, but some people may find it irritating. I started using this lip balm while I was pregnant and got a cold sore. My midwife recommended that I used this to help rid the cold sore . It did exactly that but I kept using it as it is the most moisturising and nourishing lip balm that I’ve ever used. 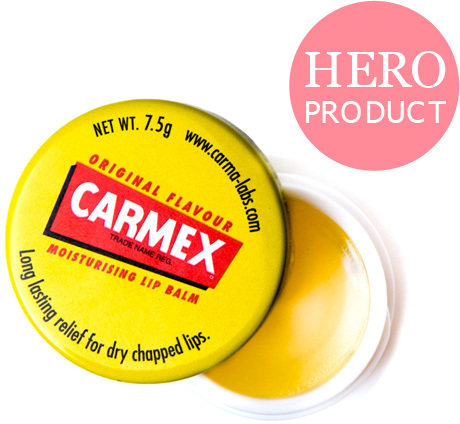 Yes I completely agree that this is a hero product, I buy this again and again and LOVE the carmex brand. I have lived in many places in Australia and this has seen me through hot dry summers and cold cracked winters. To be honest I prefer buying the squeeze tub because I am not sure this is 100 % hygienic as you are always double dipping but it works to put some serious moisture into my tired lips. Only problem is my boyfriend likes it too and always steals it off my lips. ;) I would recommend this product again and again. The social media star gets real about her beauty routine. Bet you didn’t know you could do THIS with aloe vera! Can you guess which skin care products made it into our member-rated top 100 beauty products of all time? Discover the runway make-up trends you never expected to see. Available from all good pharmacies. Tube available from selected Woolworths and Safeway supermarkets. Jar & tube available from selected Coles supermarkets and selected BIG W retailers.